With its multi layered cultural heritage, picturesque design and stylish aura, as well as being the capital of Sweden, Stockholm deserves to be referred as the ‘capital of Scandinavia’. This beautiful city has always been a popular destination among the Nordic fellows however due to its increasing fame, now Stockholm is a popular tourist destination too. 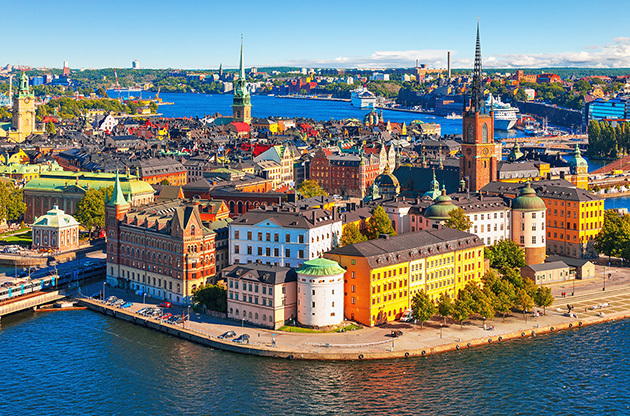 Consisting of 14 islands that are connected to each other by more than 50 bridges, Stockholm is divided into 5 regions and is home to almost 875 thousand people. Despite the renovations in the late 1970s to answer the needs of the population, Stockholm still has the soul and characteristics of a Scandinavian capital. Because of the moderate number of people living in the city, the daily life in Stockholm is highly enjoyable and contains almost no stress. The traffic jams seen rarely as many of the locals prefer public transportation and bicycle, not only because they are cheaper but also because of their improved awareness towards nature. Stockholm is like a package that has it all. Bohemian pubs and cafes are usually surrounded by parks. As the city is also a top place for higher education in Europe, these places are usually filled up with young students from all over the world. In addition to a large number of museums, palaces and theaters, Stockholm is the ultimate city for the sports lover. Almost all the roads are designed both for pedestrians and bikers, and there are special routes for runners and jogger inside the city. Stockholm is on Sweden's south-central east coast. There are three international airports in Stockholm, the most of which is the Arlanda Airport. The other two usually host budget airlines. Arlanda Airport is located 40km north of the city. There are a bunch of ways to reach the airport but the best way is the Arlanda Express. It is both the cheapest and the most environment friendly way of transportation on the way to / from Arlanda. Stockholm Public Transport operates a large number of buses, light trains and subway and the routes cover even the suburbs of the city. What I would recommend is buying an SL access card which will enable you to use the transportation system without paying for tickets every time. Taxis are not the most affordable way of transportation in Stockholm. However, if you have to use them, you can pay even with your credit card in most them. Stockholm is probably the best capital in Scandinavia in terms of the opportunities it offers to the visitors. The sights to see, shopping, dining, night life and excursions in Stockholm combine the traditional Nordic style with a touch of millennium. The private residence of the Swedish Royal Family, Drottningholm Palace and their official residence Stockholm Palace are important sights to visit. There are many museums that suit to interest of any kind but my personal favorites are The Nobel Museum, Fotografiska (modern photography museum) and Strindberg Museum (the house of the famous Swedish author August Strindberg). Drottninggatan is the heart of the shopping in Stockholm. You will see the windows of the most famous Swedish brands along the street. On Norrlandsgatan, the newly opened mall Mood Stockholm has got classy boutiques that sell a lot of Swedish style designed products. Östermalm, on the other hand, is the ‘classy’ side of the city. You can find the luxurious brands such as Gucci and Prada standing side by side. Nordiska Kompaniet and Åhléns are the two major department stores in Sweden and these two are the ones you will see the most only after H&M in Stockholm. This city also has got some cool book stores such as the Akademibokhandeln. Södermalm, Gamla Stan and Östermalm are the names of the districts you should keep in your mind for fine dining. These districts have got numerous restaurants that serve a bunch of examples from Swedish cuisine. Most of them close around 22:00, even on weekends, to that be wise to hurry up a bit if you are planning a long diner. Stockholm is a treasure for nightlife. The first thing you will recognize in the bars and clubs is probably how people look. This not because many of the clubs have dress codes, but Swedish are born chic. The clubs and pubs usually open until 2 AM. The cost of drinks are expensive. If you like bohemian pubs that serve really good quality food then I have a recommendation for you, Morfar Ginko & Pappa Ray Ray on Swedenborgsgatan 13 is probably one of the coolest places in Stockholm. If you follow the advice and go there, you can thank me by saying ‘skål’, cheers in Swedish, while you are taking a sip from your drink. One important thing: In Stockholm, you cannot buy beer in any supermarket. There are special liquor stores called Systembolaget. The age limit is 21 and the opening hours are strict. Make sure to have a look if you would like to buy some booze to keep in the refrigerator. Vaxholm is an authentic place, located only a few kilometers from the Stockholm center. There are bunch of cafes and restaurants that may add some deliciousness to your day. If you plan to visit Stockholm is summer, then Grindo, the island is a nice getaway for a swim break. Birka, Drottningholm and the Woodland Cemetry are the three places in Stockholm that are listed in the UNESCO’s World Heritage List. The capital of Sweden, Stockholm is one of the most predominant cities to host global fairs, tradeshows, exhibitions, symposiums, conferences and congresses in Europe. The centers and venues that are highly accessible and equipped in accordance with the needs of such large scale events help Stockholm to be one of the strongest candidates to host these events every year. The Scandinavian atmosphere and the scenic look of Stockholm also promises one of the most enjoyable event attending to attendees.